biscotti | KBK Bakery's Adventures in Baking! Well, I was out perusing the flavorful land of FoodBlogs and came across this wonderful recipe from Cream Puffs in Venice (http://creampuffsinvenice.ca/2007/09/13/a-sweet-reminder/ ). They are, quite simply, scrumptious! It is one of the lighter biscottis i’ve eaten. And not nearly as hard! 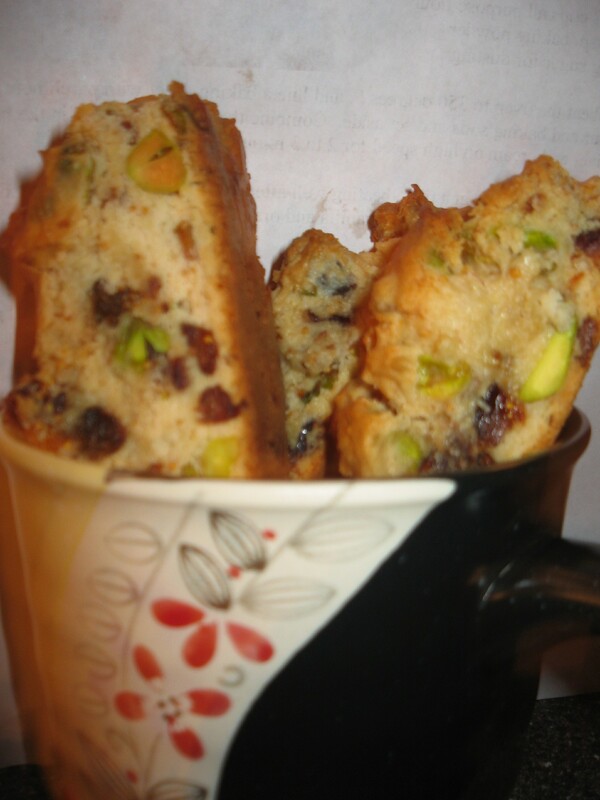 So I’m not sure if it’s really a “biscotti” or just a “cookie” as the recipe calls it. Well…biscotti or cookie, they are darn tasty! Adapted from Italian Baking Secrets by Father Giuseppe Orsini. Preheat the oven to 350 degrees F. and line a baking sheet with parchment paper. Combine the flour and baking soda and set aside. Combine the sugar and butter in the bowl of an electric mixer and cream on high speed for 2 to 3 minutes. Add the eggs, one at a time, beating well after each addition and scraping down the sides of the bowl if necessary. Mix in the vanilla and orange extracts (or orange zest). Stir in the pistachios and figs. Add the flour mixture and mix on low speed until just combined. Scrape the dough out onto a well-floured surface and gather into a ball. Divide the ball into three equal pieces. Roll the pieces into logs that are about an inch and a half to 2 inches thick and about 10 to 12 inches long. Carefully transfer the logs to the baking sheet. Bake in the preheated oven for 15 minutes. The logs will be slightly golden and firm to the touch. Remove from the oven and let cool on a wire rack for about 20 minutes. Carefully slice the logs into cookies (about an inch thick). Transfer the cookies back to the baking tray so that they are standing upright. Do not lay them on one side. Put the cookies back in the oven for 10 minutes. Let cool completely and dust with icing sugar before serving.